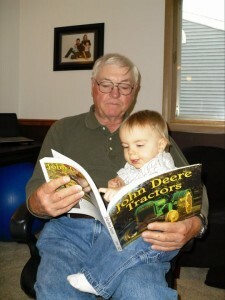 Officially, Bob is retired, but that hasn’t stopped him from farming and working hard every day. Currently, he is harvesting our corn. Of course, things don’t always go smoothly for him every day. — I figure if he thinks he has had a good day, when everything seems to go right, something must be wrong and things will eventually catch up with him. Bob has two John Deere combines. One is for soybeans and one is for corn. It just kind of worked out that way. If you know my husband at all, you know that these are not new. In fact, they are both pretty old. The one for grains is a John Deere 7700, made in 1978. But wait. The other one beats that. It’s a John Deere 55 made in 1968! Any old combine can have problems, but so can a new one, which is worse because they are new, expensive, and should run. And when it comes to getting stuck in the field, well, that has nothing to do with the age of the machine. New or old, with wheels or tracks, any can get bogged down. When we were doing soybeans, Bob had trouble with the drive on the cutting head. I lost track of how many times he tore it apart and put it back together. The worst thing was getting one extremely heavy part (a sickle wobble drive) on and off. He’d think it was all set again and take it out to the field only to return to the shop to rework it. A few times I was out there with him lending a hand. Once I squeezed my hand into a little space to try to start a nut on a bolt. I’m sorry to say I failed, but at least I was able to get my hand out again. For a moment I thought I had wedged myself into space that was too small. I wasn’t worried though. If stuck, I had Bob there to help me get out. When it came time to start corn, Bob went to the John Deere 55 combine and tried starting it. It made noises like it would go. It chugged, but never caught. My husband knew this might happen. In the summer he had worked on the engine with little luck. I think he was hoping it had healed itself while he was combining the beans. Anyway, he gave up, hopped in the other combine and set off across the corn field. He had used the reel head years ago when the corn had gone down and it worked okay, but this time not so great. The corn was too tall and too dry, unlike last year when the corn never dried. The reel knocked off ears, before bringing them into the machine. But at least he was getting most of the corn combined. Then it happened. A belt broke and the clutch that ran the reel stopped. Bob had two combines down! My husband set to work to get the belt off. It seemed that when it had broken, it hit the wires running the clutch. He snapped them back on, and addressed the belts. You wouldn’t believe how crazy-hard it was to get a new belt in place. – Bob figured the engineer that designed it never had to work on the combine, otherwise that engineer wouldn’t have hidden the belt so well. Frustration followed frustration for Bob on that 7700, so he went back to work on the engine for the 55 for awhile. No luck there either. – The engineer who designed that combine must have been the father of the other one. To get to the carburetor a person has to climb into the grain hopper! That is not something Bob even attempted. He knew if he tried climbing into the hopper, he’d never get out again and we’d be calling the rescue squad. Instead, he called the John Deere dealer and asked them to send out a mechanic for help. – Oh my gosh! My husband had to be desperate to call for help! Bob made sure they sent a mechanic with ‘experience’. Some of the young ones don’t know beans about old machines. They sent a man who actually enjoyed working on the old combines. When he started his career, these were new and he knew all about them. First thing the mechanic did was to tell Bob he had the wires to the clutch on the 7700 switched. Bob had been pulling out his hair over a simple fix. – Thank you, Mr. Mechanic. The second combine didn’t have such a quick solution. For half a day, the mechanic worked on the engine, getting in and out of the hopper with ease. Finally, he extracted the carburetor and took it back to the shop. In the end, it needed a part. Two days later, the part and the mechanic arrived back at our place. Another half day’s work and it was running again. Hurrah! Back to combining. You might have a brand new combine and all kinds of big equipment and that’s okay. But don’t count us old fogies out. We still have some life in us. We keep plugging along… and don’t cost so much.